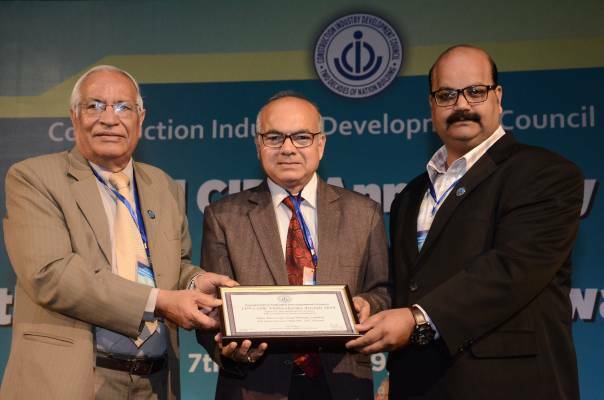 Tata BlueScope Steel honoured with CIDC Vishwakarma Achievement Award third time in a row. Awarded under the category Health, Safety and Environment for Project Kone Elevators, India. Also awarded the Best Construction Project for CP Aqua Culture India. Tata BlueScope Steel, a market leader in the field of coated steel, steel building products and building solutions, known for its world-class safety practices and operational excellence, has been conferred with the CIDC Vishwakarma Achievement Award for Health Safety and Environment (third time in a row) along with an award for Best Construction Projects category. The HSE Award was conferred for Kone Elevators, Chennai; world leaders in escalator and elevator industry, where LYSAGHT® – the Building Products vertical under Tata BlueScope Steel, supplied colour coated metal sheets for roofing and walling, along with design detailing, engineering and construction support. Known for its benchmark in world-class safety practices and commitment to Zero Harm; LYSAGHT®’s team of experts delivered over fifty thousand LTI/MTI free man-hours with a total metal sheeting of over 500 MT. Tata BlueScope Steel, under its brand EZYBUILD® has always endeavoured to manufacture and supply light gauge smart steel pre-engineered building solutions for variety of applications ranging from commercial, agriculture, institutional and residential to name a few. Reiterating its commitment for customer centric solutions, EZYBUILD® was recognised for its engineering innovation for fisheries within the aquaculture industry in India. As compared to the conventional structures EZYBUILD®’s smart steel solutions ensured greater flexibility for fishery specific structures that required longer spans and wider interior spaces. Ease in construction enabled quicker project delivery and early occupancy. Both these projects are a milestone achievement for Tata BlueScope Steel, encouraging replicable best practices within the Indian construction Industry and a commitment for innovative solutions.